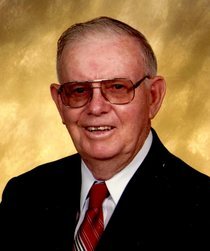 Mr. Allen E. Brookshear, 93, of Fountain City, went home to be with the Lord on Saturday, September 8. He was born in Lenoir City, Tennessee on November 12, 1924 to Roy and Juanita Hudson Brookshear. He married the former June Garrett on July 25, 1950. They were blessed with two sons in their 68 years of marriage. Mr. Brookshear was a 55-year member of the United Brotherhood of Carpenters & Joiners of America Local 912 in Richmond and loved woodworking. He was of the Baptist faith and was a faithful member of Fellowship Church of Richmond. He formerly taught adult Sunday School. Mr. Brookshear will be missed by his wife, June Brookshear; son, Neal Brookshear (Jeannie); son, Kevin Brookshear (Peggy); five grandchildren, Cody Brookshear (Lori), Megan Brookshear, Chase Brookshear, Tyler Brookshear and Brandon Brookshear; three great-grandchildren, Benjamin, Dallas and Corinne; nieces, Diane Nicholson, Beverly Whitaker and Diane Peake; nephews, Gary Voiles, Greg Vest, Rick Brookshear and Bruce Brookshear. Mr. Brookshear was preceded in death by his parents, two sisters, Florence Vest and Louise Morrel; and two brothers, Glen Brookshear and Cecil Brookshear. Mr. Brookshear’s life will be celebrated at 1:00 p.m. on Wednesday, September 12 at the Smith-McQuiston & Webster Funeral Home, 321 US 27 South, Fountain City. Interment will follow in Willow Grove Cemetery. Family and friends may gather from 11:00 a.m.–1:00 p.m. on Wednesday, September 12, at the funeral home. Memorial contributions are encouraged for the Fellowship Church of Richmond, 655 Salisbury Road South, Richmond, IN, 47374 or Northeastern Elementary School, 534 West Wallace Road, Fountain City, IN 47341 to support literacy and music programs.